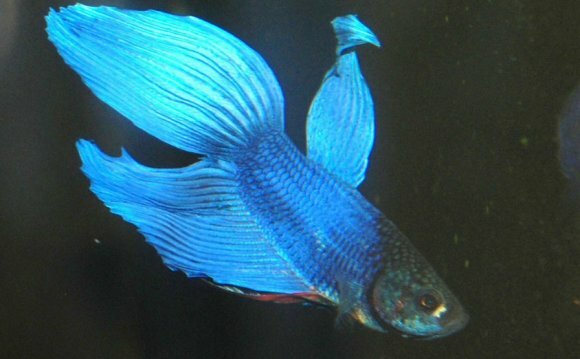 he Siamese fightingfish has long been bred in captivity, and many forms with extremely long fins, particularly in the male, have been developed. Male fishes may be green, blue or red, but females are usually yellowish-brown. In the wild, males are brown or green. Well known for their aggressive nature, male fightingfish are kept in captivity to take part in staged fights; keen observers bet on the outcome. In natural conditions, however, the fishes fight for dominance or to maintain territory, but much of the contest takes the form of ritualized threat displays, rather than actual combat. The fishes adopt postures, extending their fins and raising their gill covers, one of them usually submitting before an actual fight becomes necessary. Like many members of the Belontiidae family, to which it belongs, the Siamese fightingfish often lives in stagnant, oxygen-poor water. It is able to take in air at the surface, however, using auxilliary breathing organs within its gill chambers. Mosquito larvae, as well as other aquatic insects, are the main diet of the Siamese fightingfishes, which are consequently extremely important as controllers of these insect pests. In the breeding season, the male fish selects a suitable nest site and blows a bubble nest from air and mucus, which both protects the eggs and keeps them at the well-oxygenated water surface. As the eggs are shed, they are fertilized by the male, who spits them into the nest. The male guards the nest and replaces the bubbles if necessary.weeks.